To celebrate JCube’s opening, KFC giving you a special treat! Enjoy a FREE trade-up to Nestle Sjora with any meal purchase! Just print out or flash this coupon to enjoy the promotion. 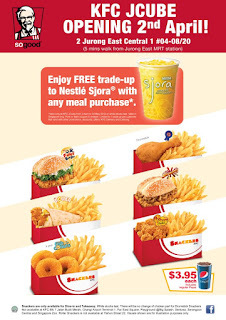 - Valid only at JCube from 2 April to 24 May 2012. - Print or flash the coupon to redeem. - Limited 1 trade up per customer. - Not valid with other promotion, discount, offers, KFC delivery and catering.